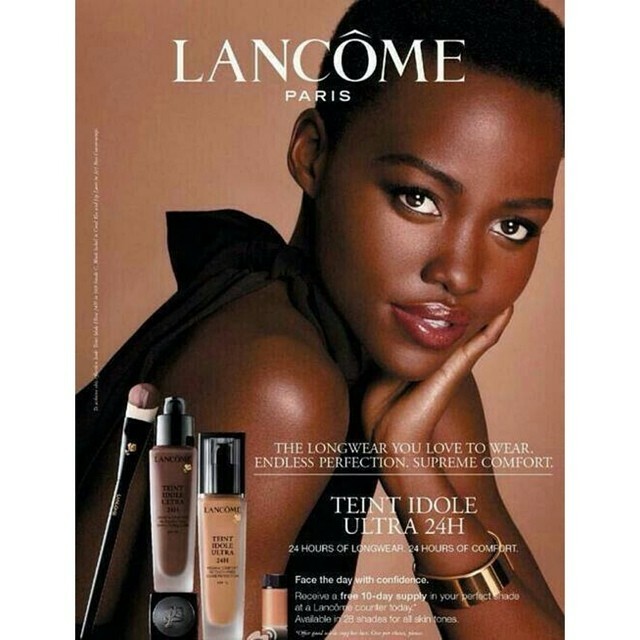 Back in April, we told you about everyone’s favorite Oscar winner, Lupita Nyong’o’s new deal with beauty powerhouse, Lancôme. Well, now the ad is out and I’m thinking twice about dropping my next check on the Teint Idole foundation she’s pushing. Yes, It’s that serious. I will give it all away. Okay, so let’s talk about this for a second. While this is considered a high-end product, the shade range in Lancôme’s Teint Idole Ultra 24H is incredible, with 28 shades to choose from. This is huge, especially if you are a woman of color, where most (high-end and drugstore alike) makeup brands tend to skimp on darker skintones. Lupita’s velvety chocolate skin is the perfect canvas to show off the product paired with lightly bronzed skin, a simple, natural-looking lip color and clean brows. She looks like absolute perfection. I might be up in Sephora getting a sample today. Don’t have a Sephora in your area? You should be able to find this in Macy’s, Dillard’s, Belk or Bloomingdale’s, though I don’t know what their sample policies are. If you’re interested, you might want to find out. What do you think? Does she look gorgeous or what? Tell us your thoughts in the comments section.